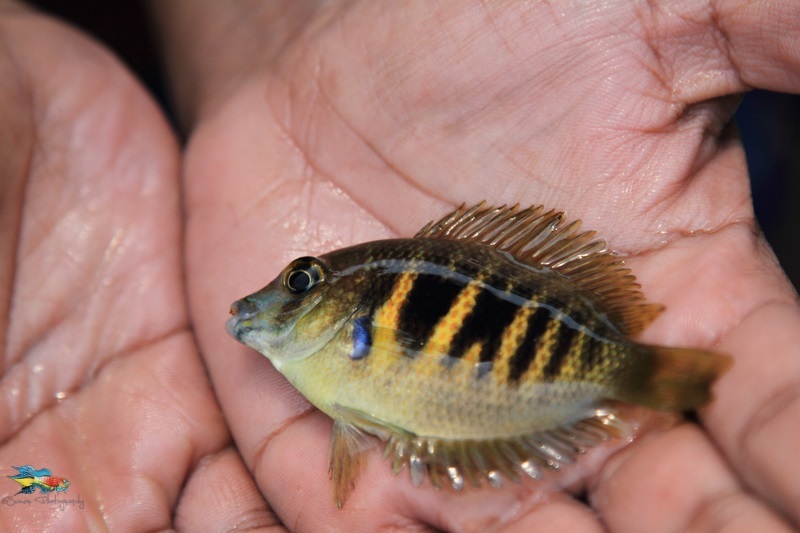 A freshly-collected specimen of Etroplus canarensis, Canara Pearlspot Cichlid. Continued from Collecting Trip to India: Part 1. 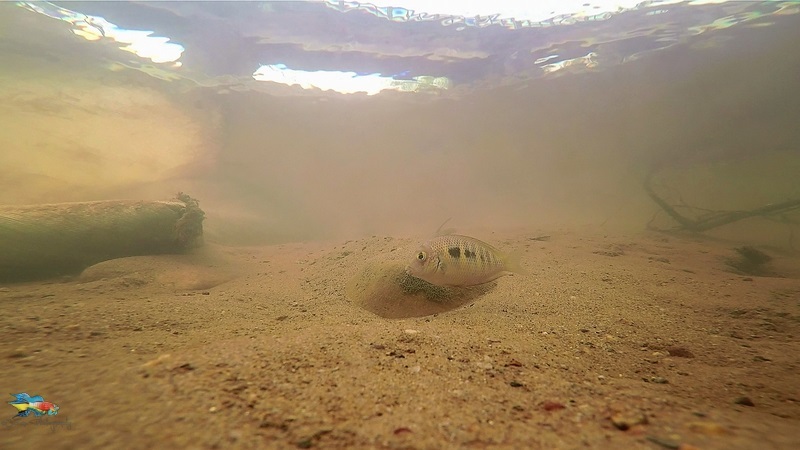 The behavior of a lone Canara Pearlspot Cichlid, Etroplus canarensis, that I saw swimming in the open water felt a little unusual to all of us. It seemed odd, mostly because these cichlids are not very fond of open waters near the bank. Instead they prefer to stay in the area where there are lot of branches and leaf litter. Upon closer inspection, I saw that it was a pair and they were swimming around a rock. I knew there had to be something special about that rock. When I approached it from another side, I saw that one face of the rock was completely covered with eggs. Both male and female were busy fanning the eggs and chasing other fishes. They were not afraid of the human presence at all. Cichlids can have such devotion for their eggs. Most of the places we stopped at during this trip to collect and photograph were near or close to bridges. 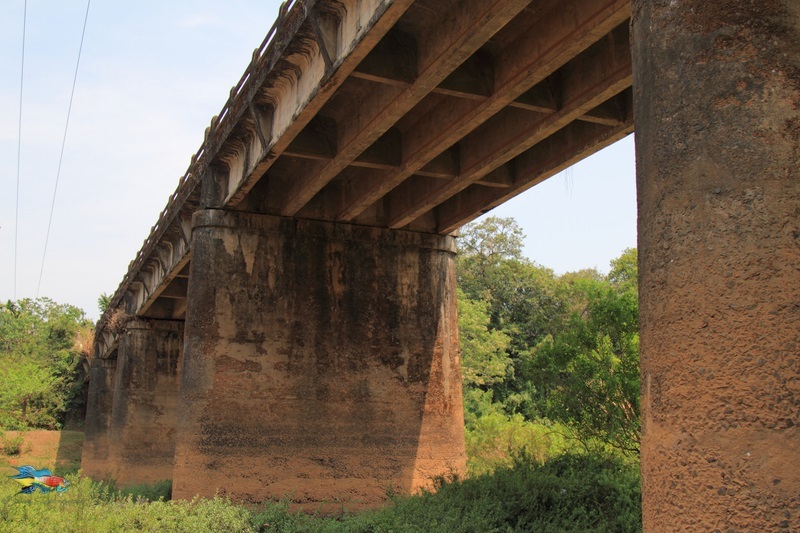 I had been in this region on a collection trip in 2012, and almost all the spots we went to on that trip were also under bridges because you can easily park your car near the bridge and get to the river. There is always a trail that goes under the bridge from the road. However, such places also invite anti-social elements during the night. Many beer lovers like to spend late evenings under these bridges drinking, which is absolutely fine. But the fact that after finishing the beer they also like to throw the bottles on the rocks to break them, is hardly welcoming for others who will go there the next time. One has to be really careful while collecting in India; I have heard many tales of people getting cuts in their feet while collecting because someone had fun breaking glass bottles. A typical bridge over a stream. Another very interesting thing that happens near the bridges is that you see a lot of clothes, idols, small earthen pots, etc. in the river. In India, throwing anything that has had religious value anywhere else except in a body of water is considered unholy. So, broken idols (broken idols are not worshiped) and stuff that becomes trash after a holy ceremony (which includes vegetable matter, flowers, oil, cloth pieces, Plaster of Paris idols, uneaten food, ashes of the loved ones, etc.) get thrown in the water. And what place is more convenient than a bridge, where you can pull up, throw the stuff you don’t need anymore, and the splash won’t even reach you? In no way am I trying to insult religious sentiments. Not at all. These practices might have been reasonable to perform when the population was less and dumping a small quantity of things in a huge river wouldn’t have caused any issues. With the population that India has now, it is not justifiable to keep with these practices that are polluting the natural resources. An argument that I often hear when I bring up this topic in the forums is, “Why don’t you blame the industries that are dumping the toxic waste in the water? Why do you just try to preach on the religious factor?” Well, I am trying to educate wherever I can. I think the industries are aware of their wrongdoing, but they still do it, and so my preaching is not going to do much to them. But I can sure try to educate the people who are unaware of the results of their acts. Wild fish collectors and exporters have also been a topic of controversy, with individuals expressing concerns about over-collection. I have had discussions with some of the main fish exporters and scientists in India who claim that there is no data to support that fish populations have gone down because of the ornamental fish industry. With more and more fishes being bred in captivity, this argument will fade away in near future, thanks to the captive ornamental fish industry in India. Etroplus canarensis guarding eggs. It is not very clear if this particular specimen was a male or female. Bridge is clearly visible in the background. After watching Etroplus canarensis guarding their eggs for some time, we started driving towards a town called Subrahmanya. Right before we entered the town, Rahul took us to a beautiful stream. Unlike other spots, this wasn’t under a bridge. Rahul tried his big cast net here and caught a bunch of Barilius canarensis (Jerdon’s Baril) and Hypselobarbus jerdoni (Jerdon’s Carp). We also found a recently described catfish, Pseudolaguvia lapillicola, at this spot. After a tiring day, we all were ready to hit the bed. 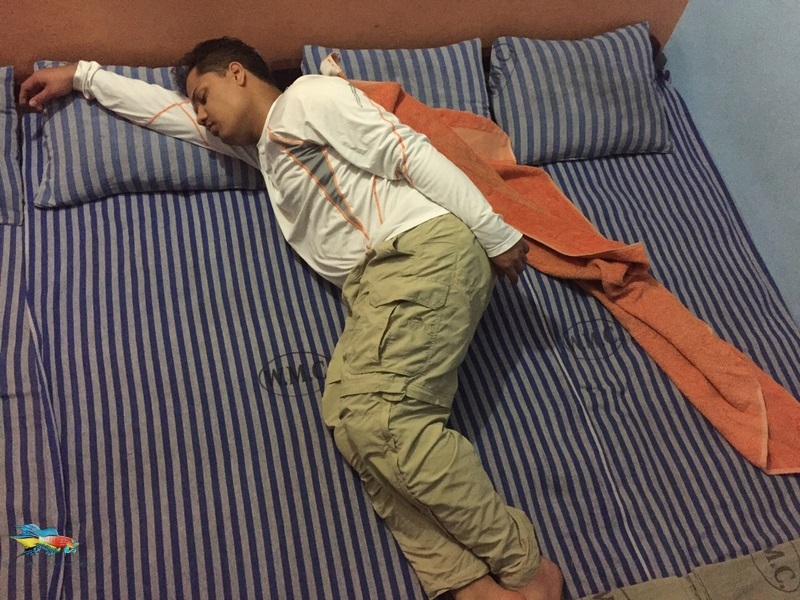 I was very tired and collapsed into sleep as soon as I reached the hotel. Looking at my posture, my wonderful friends could not resist transforming me into Superman. We left for Mangalore the next day; more on that in the next installment. Continue in Collecting Trip to India: Part 3.